What's interesting to me, therefore, is to look at Azeroth now and see how it may not have been that group of heroes atop Icecrown Citadel who proved Arthas' point, but that point was proved, and by someone who benefited from Arthas' madness. We talk a lot about corruption, but one can be corrupted not by alien gods or evil presences, but purely by one's own actions. One could argue that Arthas was corrupted not by Frostmourne or the Lich King, but by his own hand and his own actions. The war Arthas started raised Garrosh Hellscream from a hothead with no real position of authority to the head of a Horde war machine that rolled successfully across the frozen north. Make no mistake. It was Northrend that truly showed the Horde its own strength for the first time. The Might of Kalimdor was a joint venture, and the battles across Outland were scattered, a series of excursions rather than a full fledged military campaign. In Northrend, the Horde flexed its muscles for the first time since the Founding of Durotar, and it found itself mighty indeed. Not only did Garrosh motivate his people to expand across the Borean Tundra, through the Dragonblight and Grizzly Hills, and push north through Icecrown itself but he did so with the kind of brutal efficiency not seen in a Horde leader since Doomhammer. And as he did so, he met the Scourge again and again in battle. While the Wrathgate was a traumatic experience for the Alliance (the loss of Bolvar, the shock of Undercity to King Varian) it simultaneously removed a future rival and taught Hellscream exactly what he would be facing in the upcoming war. The Scourge was a remorseless, pitiless enemy. It did not know fear, it would not negotiate, and so Hellscream employed the only tactics that would be successful against it - total war. You can see the legacy of Hellscream's war in Northrend across Kalimdor today - the seizure of Azshara, the encroachment into Ashenvale and Stonetalon, the push into Gilneas, even the destruction of Theramore are all of a piece with the war that Hellscream learned to fight a war. It's easy to forget that Hellscream, for all his bluster, had never seriously led anything militarily meaningful before Northrend. This is an orc who spent years gripped by depression and self-loathing, who let Jorin Deadeye do more to lead the Mag'har than he bothered to do himself. When Hellscream came to Orgrimmar. he did so as the untried leader of a clan he'd never seen (the Warsong) whose only leadership experience was in failing to do anything for the Mag'har. Thus, in a very real sense, Hellscream's tutor in war was the Lich King. It was Arthas and his obsession with demonstrating the cost of power that led Hellscream on a merry chase throughout the continent, fighting both the Alliance and the Scourge the whole way. 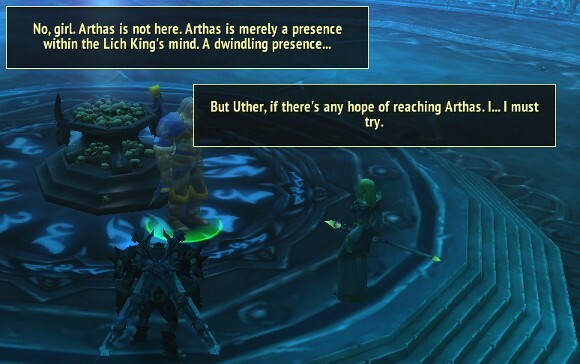 What did Arthas, the part of Arthas still alive inside the Lich King, want to teach us? Ultimately, that power corrupts. Power corrupted him, and it will corrupt you, too. That it is inescapable, and thus, Arthas couldn't have escaped it - that becoming the Lich King was inevitable, that all kings and princes and people of power ultimately end up slaves to themselves. Not the madness imposed by outside forces. Not Frostmourne or becoming the Lich King - rather, that moment outside Stratholme where Arthas dismissed Uther and Jaina and went on alone to burn and slaughter his own people in order to save them. 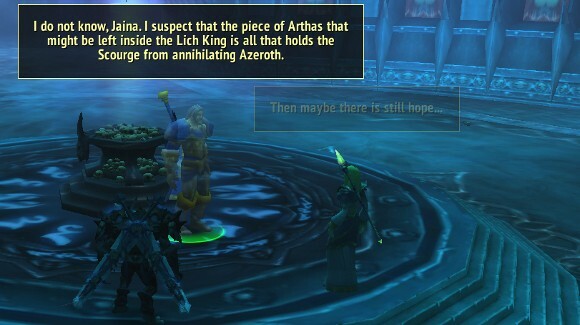 Different sources tell us different things about how much of Arthas was alive and in control of the Lich King. The novel Arthas tells us that Arthas' personality and motives dominated, that Ner'zhul was either destroyed or reduced to almost nothing. But the games seem to hold to the idea that Arthas and Ner'zhul merged, and that Arthas existed in the Lich King entity as a voice of temperance holding the Scourge back. So combine the two thoughts - one, Arthas was not the dominant force in the merged Lich King entity, and two, even when Ner'zhul was alone (albeit greatly changed and expanded by Kil'Jaeden) he was not making full use of the Scourge. So we've talked about how Arthas may have influenced Garrosh, but we haven't talked about this: how did Ner'zhul influence him, and everyone else? How much of Arthas' schemes were in fact Arthas at all? How much of it was Ner'zhul? Remember that encounter with the Lich King in Howling Fjord I mentioned earlier. In it, when the Lich King seizes your spirit form, he specifically states the following. Shamanism has brought you here... Its scent permeates the air. *The Lich King laughs* I was once a shaman. I find that phrasing very deliberate. Ner'zhul was the shaman, not Arthas. With what we know of Ner'zhul's history - how he instigated the war against the draenei at Kil'jaeden's deception, how he sought to turn his people away once he learned he'd been tricked only to be betrayed by his own student Gul'dan, how he watched powerless to act as the Horde was formed and Grom Hellscream drank the blood of Mannoroth, and how he sought to unite the defeated remnants of Gul'dan's Horde and lead the orcs to a new world - we're left to ask ourselves, how much of what the Lich King taught Garrosh was Arthas' doing, and how much of it was Ner'zhul? Did Ner'zhul make use of Arthas' overweening ego and need to prove himself justified to set a trap, allowing the fallen Prince of Lordaeron to play out his psychodrama while taking each step along the way to teach young Hellscream the lessons he would need to make this world a fitting one for the orcs to dominate, and in so doing, make his own dream of finding a new world for the orcs a reality? In the end, the Lich King was Hellscream's greatest teacher. One can act completely of one's own volition, with no magical influences, and corrupt one's own self through the wrong action, learned from the wrong lessons.